Though only a sophomore, Maggie Paris is a star on the varsity swim team, but she also has an uncanny, almost magical ability to draw out people’s deepest truths, even when they don’t intend to share them. It’s reached a point where most of her classmates, all but her steadfast best friend, now avoid her, and she’s taken to giving herself away every chance she gets to an unavailable -- and ungrateful -- popular boy from the wrestling team, just to prove she still exists. Even Maggie’s parents, who are busy avoiding each other and the secret deep at the heart of their devastated family, seem wary of her. Is there such a thing as too much truth? A lyrical and deeply moving portrait of grief, blame, and forgiveness, and of finding the courage to confront your ghosts -- one truth at a time. 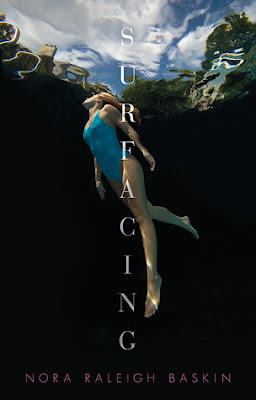 Surfacing is a deeply moving novel that young adults will truly appreciate. Nora Raleigh Baskin strikes the perfect balance between the struggles of a teen and her grieving family and the typical teen experience. Maggie believes she has the ability to draw people to her just to have them reveal their most personal secrets. Her only solace lies in swimming, her one true friend Julie, and her obsessive crush on captain of the wrestling team, Matthew. With a solemn opening in the voice of Maggie's older sister Leah, readers are drawn into the heart of the story. Baskin gets to the point quickly, pushing readers through meaningful connections between Leah's drowning and how Maggie and her family deal with the long ago tragedy. Leah's interjections into the plot are reminiscences of their childhood and sometimes present observations, as if she's an invisible fly on the wall. A clever and interesting addition to the story, Leah will help draw readers' perception of Maggie. As Maggie struggles with grief and guilt over the event that further tore her family apart she begins to follow a destructive path. She's very naive in this regard, as if she recognizes that she's headed on a wrong course, but lets her low self-worth mean that it's all okay. Sometimes it's hard for even the reader to figure Maggie out, she shuts us out just as effectively as she shuts out her friends. Ultimately, though, her story shows its heartbreaking reality. Baskin's soft writing style takes the edge off any extreme emotions, but carries them into the hearts of readers. Surfacing will strike chords in readers young and old!